As a nail or tanning salon, you want to differentiate yourself from the competition. Start by always giving patrons premium white hand towels during and after their services. Both staff members and patrons will appreciate these 15” x 25” towels that not only stay fluffy use after use, but also get the job accomplished without fail. They look great, they work well and they’re priced at wholesale rates. It’s the perfect mix for your needs. 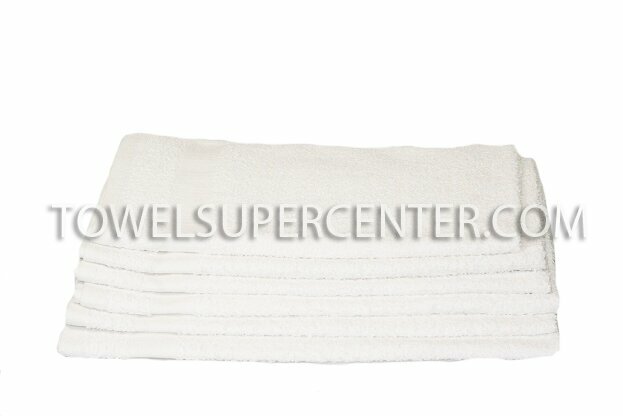 Partner with Towel Super Center for all your premium cotton hand towels and other towel purchases. Order online for fast, convenient shipping. Absorbency: Have you been frustrated in the past by hand towels that just won’t soak up liquids or excess moisture? Cotton is different. It’s naturally thirsty, which means it’s more dependable than other materials. Fast Washing and Drying: Who wants to spend too much time washing and drying hand towels? Your day is busy enough already. Now, you can be more efficient with cotton towels that wash well the first time around and dry rapidly. Odor-Resistance: Put an end to stinky, smelly towels that no one wants to use. Cotton lets go of odors, and that makes you feel more confident about using cotton hand towels for all your salon services. Utter Softness: You can’t put a price on the power of softness. Even your guests with sensitive skin will feel pampered by these fluffy cotton hand towels. Toughness: Sure, they look plush, but don’t let our cotton towels fool you. They’re willing to work tough day after day without breaking down. Spend less money on buying replacement towels by buying premium ones at the start. Salon-Perfect Size: At 15” x 25”, our cotton hand towels are just the right size for all your nail and tanning salon uses. It’s never been a better time to stock up on premium cotton hand towels. Remember that our towels have no designs, making them perfect if you’re looking for towels to custom-embroider at your local embroidering shop.